This is a simple pair of turquoise earrings which you can easily make within ten minutes. They look simple but when you put them on your ears, they can greatly enhance your look tremendously. They are easy to make too and if you are in a hurry and need a pair of simple earrings to go with your outfit, this is it. You can change the stones and replace with any that matches your clothes. Click on the image for expanded view. Hook the gemstone beaded drop onto the ear hook. Repeat step 1 and 2 for the other earring. If your stones are big and take up all the space on the head pin, then put the citrine and crystal chips on a eye pin thus creating a beaded link. Attach the turquoise and ember beaded drop to one end of the link and the other end of the link to the ear hook. Isn't that easy! 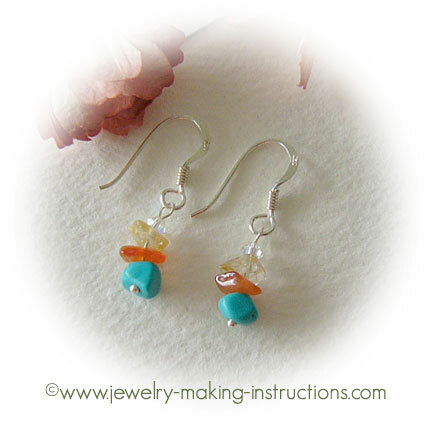 Here's another turquoise earrings you might like to try making.